Ambassador Friedman, presidential aide Chris Neeley visit Palmachim air base, meeting IDF soldiers with autism and various disabilities. 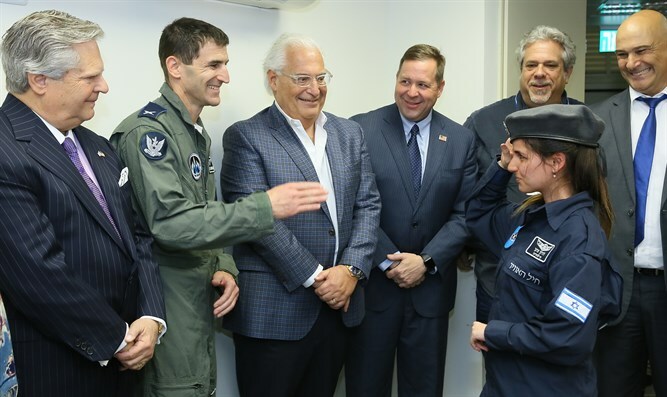 United States Ambassador to Israel David Friedman and President Donald Trump’s aide Chris Neeley, who also serves as Chairman of the U.S. President's Advisory Committee on People with Disabilities visited the Palmachim Air Force Base this week along with a delegation from the JNF Taskforce on Disabilities. The purpose of the visit was to observe and learn how the IDF has successfully incorporated 50 young men and women with assorted disabilities into military life on base, with the long-term goal of adapting the project to meet the needs and soldiers of the United States Armed Forces. The IDF’s Special in Uniform program, a brainchild of Lend A Hand to A Special Child that operates in partnership with Jewish National Fund (JNF), integrates young people with autism and other disabilities into the Israel Defense Forces (IDF) and, in turn, into Israeli society. Its core belief is that everyone belongs and has the right to strive to his or her full potential. Special in Uniform focuses on ability, not disability, emphasizing the unique talents of each participant to help him or her find a role within the IDF that encourages them to contribute to Israel’s military and help keep her citizens safe. At present, Special in Uniform encompasses some 400 youth with special needs in approximately 30 bases across Israel. During their first year, they serve as volunteers, after which they graduate to becoming full-fledged soldiers. Not long ago, it was rare, if not impossible, to meet a soldier with autism or Down’s syndrome; yet today, they are incorporated in many bases in Israel and valued as integral members of the IDF with each soldier contributing his utmost to defend the country. Ambassador Friedman, who met soldiers with disabilities at their work stations, was highly impressed with their achievements and the prevailing atmosphere of warmth, inclusion and acceptance on base. The soldiers confided to the Ambassador and his delegation how proud they are to serve in the army. One of the soldiers they encountered was a young man with cerebral palsy named Roi Schiffman. Throughout his life, Schiffman nursed a dream of joining the IDF. Many attempted to dissuade him, explaining that it was impossible yet he persevered, joining Special in Uniform. Today, he works in the Palmachim infirmary where he prints and issues documents. Deeply moved by the visit, Friedman expressed: “I’ve visiting many army bases and observed the arms and brain of the IDF. Today, I see the heart of the army.” It should be noted that, Israel is prsently the only country in the world that integrates citizens with special needs and disabilities into its military, and this is part of a global national outlook that welcomes inclusion in all areas of life.